The Gossips of Rivertown: Is This Getting Old Yet? 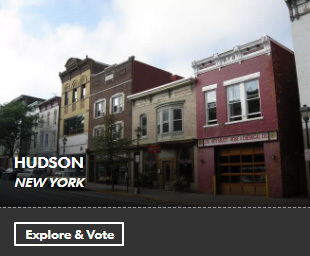 Two years ago, Hudson was one of twenty places vying for the distinction of being named Best Historic Small Town in USA Today's 10 Best competition. This year, Hudson is one of the twenty nominees for Best Small Town Food Scene. Click here to check out the competition (there's another Hudson Valley town in the race) and to vote. You can vote every day until the polls close at noon on Monday, May 14. Hudson is currently in ninth place. Thanks to Ann Cooper for bringing this to our attention. I couldn't find a place to vote for Hudson.